Background: Even before my wife and I got engaged we were considering a trip to Africa. Once we were engaged I asked if she was still up for going to Africa for our honeymoon and she was all in. Now I wanted to find the perfect place, a place where we would both be comfortable and enjoy ourselves. We were considering South Africa and Namibia. I bow hunted in Namibia in 2007 and absolutely loved it but my wife has never traveled internationally. It wasn’t long after our search began when I read some very positive reports about Johann Veldsman and his operation, Shona Hunting Adventures. Johann has numerous properties/concessions available to hunt but also specializes in non-hunting activity planning as well. 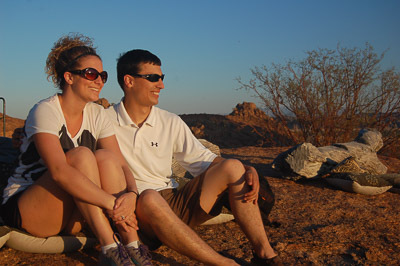 Johann set up a perfect itinerary for us and it was decided…we were headed to Namibia two weeks after our wedding! Travel: On my prior trip to Namibia I used SAA direct from Dulles to JoBerg and then on to Windhoek. This time we again used SAA but went JFK to JoBerg to Windhoek. I know there are a lot of complaints about SAA but I’ve had no problems with them thus far. The flights to and from Namibia went fine (as well as 15 hours on a plane can go I suppose) but when we go back to Namibia we will probably try the Frankfurt route to take advantage of the long layover there. We arrived in Windhoek at 2:30 in the afternoon. Clearing my rifle there was rather painless and Johann was waiting for us with a smile once we collected our bags. Quickly we jumped in the land cruiser and headed for Swakopmund where we would be spending the first few days of our honeymoon. My wife and I decided to try a day of surf fishing along the skeleton coast. She started to fish with me when we first started dating and now really enjoys it. Neither of us had ever surf fished and we were really looking forward to the opportunity. Initially, we were scheduled to fish the second day of our trip but heavy winds were scheduled to blow in that day and Johann and Leon, our fishing guide, thought it would be best to fish the first day….Boy were they ever right! We were up early and drove the hour up to Hentiesbaai, a small fishing community north of Swakopmund, where we met up with our fishing guide Leon and his assistant, Dilano. Leon has been guiding fishermen along the coast near Hentiesbaai for years and was also a member of the Namibian competitive fishing team for seven years. Our fishing targets for the day would be kabeljou (white fish) and with some luck, shark. Kabeljou are targeted frequently due to their good taste. Although, shark fishing is probably what the skeleton coast is most famous for and the predominant species there are bronze whaler sharks (“bronzies”) and spotted-gully sharks. The equipment consisted of 14 foot surf-casting rods, 8 ounce sinkers, and cut bait. Watching Leon and Dilano cast was amazing; it appears to be a combination of throwing a shot put and casting. Leon told me that his casts usually go about 150 yards! Once your baits are in, the waiting game begins. It started slow but within an hour Mel and I had both caught our first fish. Not long after, Leon hooked onto a big fish and handed me the rod. His impression was that it was a spotted-gully shark due to the hard fight but it ended up being a large kabeljou. The best fishing for kabeljou is earlier in the year and Leon was surprised to see one this big. Not a half-hour later, Dilano hooked onto a large fish which turned out to be an even larger kabeljou! Now it was Mel’s turn for a big fish…and she didn’t have to wait too long. Within an hour Mel had landed the third big kabeljou of the outing and shortly thereafter she landed the biggest fish of the trip. Her big kab weighed in at over 20 pounds. At this point Leon was nearly in shock; he said that he normally only catches two kabeljou near this size every year and we’ve already caught four by lunch. As morning led to afternoon we had a number of good bites and I landed two more big kabeljou. Leon said “you really don’t know how lucky you guys are” and after talking with some more local fisherman that became evident. All of the other fisherman we talked to that day caught very few fish. Unfortunately, we never got an opportunity at shark but the water was murky which is not ideal for shark fishing according to Leon. Nonetheless, what a great start to our trip! Today we slept in as we had a number of activities planned for the day. Johann met us in Swakopmund for lunch and then we were off to some street markets in Swakopmund. It is always interesting to visit the local curios. After our brief shopping excursion we headed to a small snake museum in town. The museum housed a number of snakes indigenous to Namibia and southern Africa which fascinated me but gave my wife the creeps. From camel-riding we moved onto the dunes of the Namib. First, Johann recommended we try out ATV riding on the dunes and it was a blast! After ATVs and as the sun began to sink we headed to dune 7. To some, dune 7 is considered to be the tallest sand dune in the world. At dune 7 we would be doing some dune surfing. Basically, it is sled riding where you don’t get snow except these sleds go a lot faster. Climbing the dunes is one hell of a workout and we each did three runs from progressively higher spots on the dune. Once you are riding the dune you gain speed quickly and efficient stopping is imperative as there is some gravel at the bottom of the dune. Unfortunately, my wife wasn’t the best at stopping and ended up with some cuts and scrapes but she was a trooper. This evening we ate at a seafood restaurant in Swakopmund, the Ocean Basket. We had the best, and interestingly the cheapest, calamari dinner we’ve ever tasted. If you’re ever in Swakop, I would highly recommend this place. Today we would be leaving Swakopmund and heading to Damaraland where we would spend the evening at Mowani Mountain Camp. Along the way we stopped at one of the skeleton coast shipwrecks. For lunch, we stopped under the shade of a camel thorn tree and had a short picnic. We arrived at Mowani Mountain Camp in the early afternoon and relaxed for a few hours before visiting Twyfelfontein. Twyfelfontein translates to “doubtful spring” and it is home to numerous rock carvings. These rock carvings are 2,000 – 6,000 years old and were believed to be made by either Bushmen or Damaras. The carvings frequently depicted giraffes as they were seen as holy; it was believed that due to their tall height they held the power to bring rainfall. One rock in particular was fascinating as it functioned as a teaching tool. It included carvings of all the animals in the area with the corresponding track carved next to it. At sunset we enjoyed sundowners at the camp. Tomorrow we are heading to Johann’s hunting lodge, Tualuka lodge. Originally, we were scheduled to do a hot air balloon ride over Damaraland but high winds cancelled those plans. With some free time on our hands Johann thought an excursion to look for the desert elephants would be worthwhile. The elephants had been seen recently and Johann wanted to check with some of the local villagers. We stopped at a small village along the now dry Aba Huab river where one villager said the elephants had been just a few hundred yards up river last night. Less than a 10 minute drive up the dry river bed and there they were! It was a group of 14 in total, mostly cows and calves. We sat and watched them for the longest time and Johann gave us some lessons on interpreting elephant demeanor and posturing. We made one last stop on the way to camp, the petrified forest. The petrified forest lies on over 65 acres of ground and the petrified wood is over 200 million years old. With time, pressure, and the deposition of minerals the cells of the tree are replaced by mineral and the wood becomes petrified. Now it was time to head to the hunting lodge, Tualuka. It is a stunning lodge set at the base of a rocky koppie. The lodge is situated on over 16,000 acres of unfenced hunting ground…it is truly a phenomenal place. There we met Johann’s lovely wife and daughter, Vera and Zoe. We had a quick lunch and short rest before heading off the check the zero of my rifle. My rifle was a little off after the traveling but after a little tweaking we were back in business. During the hunting portion of the trip I was hoping to get an old kudu bull and mountain zebra. My first priority was kudu; I told Johann that I was looking for an old bull and I didn’t care as much about the inches. Also, I was really hoping to introduce Mel to hunting. She was going to come along on some of the hunting days but had no intention of hunting herself. I’m really appreciative she gave up time on our honeymoon for me to hunt. That first afternoon Mel decided to catch up on sleep as we stalked a bottom on the northeastern portion of Johann’s property in search of kudu. We stalked up on kudu cows, gemsbok, and warthog that first afternoon but no kudu bulls. However, just before sunset we came across the elephants. Johann turned, smiled, and said “this puts a whole new flavor on plains game hunting for you doesn’t it?”. The elephants roam on and off Johann’s property as they please and we were privileged to see them that afternoon. This was the first full day of hunting and Mel would be joining us for the day. Breakfast was at 5:30 and we were in the land cruiser shortly thereafter. We headed to a different part of the property than yesterday hoping to come across kudu or zebra. Slowly we worked up a small koppie and when we reached to top Johann spotted some zebra on the opposite hillside. Unfortunately, they were a long ways off and already working over the crest of that hill. We continued on and ran into another zebra herd in the thick brush but it just wasn’t meant to be as they were on to us. The wind progressively picked up throughout the morning and really made for some tough hunting conditions. As the morning progressed we moved on to some vantage points hoping to glass some kudu in the bottoms but to no avail. We took an early lunch hoping that the wind would die down in the afternoon. The terrain here is much different than the area of Namibia I hunted five years ago. In 2007 I hunted in eastern Namibia near Gobabis. It was very flat near Gobabis and the vegetation was predominantly scrub brush with occasional camel thorn trees. At Tualuka, the terrain consists of rocky koppies largely populated by mopani trees with bottoms filled with camel thorn trees that are now dropping the last of there seed pods…a major attraction to game. With mopani trees, come mopani bees. Mopani bees are slightly bigger than gnats back home but equivalent on an annoyance scale. By 3:00 we were back in the field and the afternoon would prove to be very eventful. Not long into the afternoon we came across an older kudu bull. He was an older bull but had very narrow curls. Johann said we could do better and we moved on. Only minutes later we came onto another good looking bull. He had nice shape to his horns, was mature, but he was still on the young side. As we looked him over Johann turned to glass in the opposite direction and noticed some kudu cows trickling into the bottom from a draw. At the end of a string of cows came a big bull. It only took about a millisecond of glassing to determine this was a definite shooter. Quickly I was on the sticks but, as it happens so often, a cow in the front of the herd spotted us and took the herd away. Johann and I chased after them in hot pursuit but we never got another look at that bull. What an exciting afternoon! For dinner Johann and Vera arranged a private meal for us. We had fried kabeljou for dinner with homemade French fries and it was fantastic. Mel decided to sleep in this morning. Meanwhile, Johann, Tjokkie (our tracker), and I climbed a koppie at first light to glass for kudu. It didn’t take long until Johann spotted a bull with some cows in the bottom. He was a good looking bull, certainly shootable, but still on the young side. We watched him for a long time and discussed the risk of passing up this bull. But we were looking for a really old bull and I think Johann put it best, “past experience has told me that if it doesn’t feel right, it probably isn’t”. I agreed and we moved on; this just wasn’t the bull we were looking for. We climbed several more koppies to glass and as mid-morning approached Tjokkie spotted some zebra on a distant hillside. They looked relaxed and in no apparent hurry so we made our move. Our goal was to climb up the backside of a small rocky outcropping and take the shot from there. With haste we got to that outcropping and into shooting position as the zebra relaxed in the shade the mopani trees granted them. One zebra looked promising…big bodied and muscular. The brush was protecting the zebra and I waited in prone position on a rock ledge hoping for a shot. Several minutes later the zebra took a step forward, “I need one more step” I whispered. A few seconds later that step came and the shot was off instinctively. At the shot the zebra reared back and fell to its side. As it hit the ground I was chambering another round but a second shot would not be necessary. We had our zebra. As we approached the downed zebra we found that it was a huge mare. Johann said he’d never seen a mare this big in body size. She was old and absolutely stunning. Now it was time to get her out of the mountains. Johann walked to the nearest road and radioed for back-up to bring the Unimog. The Unimog is a really impressive vehicle and with some patience Johann was able to maneuver it right up to the old mare. With one objective completed we refocused on kudu for the afternoon. Mel joined us as we stalked along one of bottoms at Tualuka. We were hoping to find the big bull from yesterday evening but he never turned up. However, we did run into the bull from this morning but the more we look at him, the more it becomes evident that he is not the old bull I really wanted to find. That night we stayed at a tented spike camp. The spike camp was set up by Johann’s apprentice, Vellies. Vellies did a really nice job setting the camp up and we were the first to stay there. It was very comfortable and life doesn’t get much better than sitting around the campfire in Africa. With zebra out of the way we turned our full attention to kudu. Mel decided to take a personal day while Johann, Tjokkie, and I would push ourselves to find a really old bull. It was particularly hot this day with almost no wind to speak of. With no wind came the maddening hum of mopani bees all morning. The wind didn’t cooperate early in the morning but we’ve had plenty of good tracks to follow all morning. Late morning finds us a large valley when Johann and Tjokkie spot a bull resting in the shade of a Sheperd’s tree. This trip has revealed one thing…this Pennsylvania deer hunter’s glassing skills need some work. However, Johann and Tjokkie were really impressive behind the glass. We decide to have a closer look from another koppie. This bull has nice deep curls, good bases, but he is just too young. He will be a great bull in another year or two. After lunch we are back in the bottoms when Johann gets an excited look in his eyes as he encourages me to follow. There are some bulls and cows in front of us and Johann says one is a nice old bull. But the bulls are on the move and we play cat and mouse with them until they out maneuver us. I was up early while Mel slept in as she planned to visit a local Himba village and cheetah farm with Vera today. I was really hopeful that we would get a bull early so I could join them by mid-day. We left the lodge on foot and, like most mornings, climbed a koppie to glass. Our glassing didn’t yield much so we climbed down and slowly stalked a bottom as the sun rose. Not long into the stalk we spotted some cows. With them was a nice bull. We crept as close as we could and Johann set up the sticks. But by the time I was on the sticks the bull was already moving off as he chased a cow. The group wasn’t spooked so we tried to out flank them. It wasn’t long until we were back on the herd and I was back on the sticks. I intently watched a bull just a few steps from being in a shooting lane but careful inspection revealed it was a different, younger bull. Some more kudu began trickling through off to our left and I reposition hoping the old bull follows the cows. A decent bull appeared but not the one we are searching for. The groups moves off and the nice bull never reappears. For the first time I feel frustrated. There are plenty of bulls, we have been so close, and all we need is one break but I suppose kudu bulls didn’t earn the name “gray ghost” for nothing. We continue stalking in a “J” pattern and work back to the base of one of the rocky mountains. Tjokkie goes on high alert as he spots kudu cows working up the hill to our left. Johann pulls up his binoculars and brings them down almost as quickly, “there is a nice bull”. We move forward and I’m on the sticks. A group of cows with a young bull moves across the mountain about half way up. A second group now moves from left to right just below the first group and there he is. I’m on the sticks and following him, waiting for a clearing; I estimate in my head that it is 175 to 200 yards. My first shot rings out as he moves across the first available opening, “It’s a miss”…Damn! I reload as the bull has now paused. Oddly enough, he begins moving back to the left with a cow. He crosses another opening when my second shot is off…”Hit!”. I chamber another as he reaches another opening and fire again…”Hit!”. But he’s still up, now he’s angling downhill to the left and at the next shot he collapses. There is an eruption of elation from the group. There is hugging, high fives, and I need to sit down for a moment. We’ve all worked so hard for this bull. Johann says “that is at least 280 yards”. I had underestimated the yardage and my leads should have been larger for the moving bull. As we climbed the hill and approached the bull we discovered that all four shots connected but they were farther back than I would like. Nonetheless, it got the job done. The bull is magnificent. He has a scarred face and the wrinkles of an old man; Johann estimates him at 14 years old. His horns have worn ivory tips with deep gouges to reflect his age…in my eyes he is perfect. What an experience! We hunted free range kudu on foot and were able to take this ancient old bull. It was the most rewarding hunting experience I’ve ever had. One of my favorite memories is waiting on the hillside with Tjokkie and other camp staff while Johann went back for the Unimog. Tjokkie re-told the story of the hunt in Afrikaans. I don’t understand Afrikaans except for a few words but you could understand the story from his tone and the excitement of his gestures. That is why I love hunting; our hunting culture knows no boundaries as it is a part of our human nature. After some photos and loading him into the Unimog we head back to camp for a late breakfast. Getting our bull this morning allowed me to join Mel and Vera for a trip to visit the Himba and cheetah farm. We headed to the Himba village first. The Himba are a nomadic tribe of herders that reside in northern Namibia and southern Angola. They are a friendly, charismatic group of people and we really appreciated visiting them and their willingness to introduce us to their culture. After a few hours with the Himba we went to a local cheetah farm. The owner has 3 tame cheetah which were either rescued or rehabilitated. In addition, they have a number of wild cheetah on their ranch which we had the opportunity to see as the owners fed them. We slept in as we were driving north to Etosha later in the morning. As we packed our car the camp staff came down the steps singing well wishes to us. We both stood, with tears in our eyes, as they sang their goodbye. A few short hours later we were entering Etosha. We would be staying at Okaukeujo which is government owned and located in the park. There are numerous luxury lodges located outside the park but Okaukeujo has the advantage of having a waterhole where you can go, at any hour, to view the game. That first day we saw hundreds, if not thousands, of zebra and springbok as well as wildebeest, black-faced impala, and giraffe. After our evening game drive we checked the waterhole at Okaukeujo where elephant were waiting. Our last day was spent at Etosha and we were up early hoping to catch the game moving at first light. The highlight of the morning was getting to witness a lion kill. Late in the morning we drove up to a waterhole and found a young male lion lying near water’s edge. Zebra herds stood at a distance and stared at him while a female warthog with a piglet approached the water, oblivious to the lion’s presence. The hunt was on as the lion took after the piglet. He gained ground quickly and within seconds it was all over. Johann got some great photos of the action with his long lens. For the afternoon we relaxed and intermittently check the waterhole at Okaukeujo. We sat by the waterhole for the last sunset of the trip and watched a tuskless and big elephant bull work their way to the water. After dark we joined several park rangers for a night drive where we saw several black rhino and hyenas. Even more exciting, we sat and listened to the call of lions in the distance. It was a great ending to our trip. Our trip was everything we could have wanted and so much more. Namibia is a wonderful country; it is safe, sparsely populated, has fantastic hunting, and has numerous non-hunting activities. I’ve been there twice and I will go back again. Johann, Vera, and the entire Shona crew are absolutely top-notch. They flawlessly arranged our itinerary from the moment we stepped off the plane until the moment we got back on the plane. My wife approached this trip with the desire to see Africa once but left waiting for the opportunity to go back. She has not traveled much and a trip to Namibia was really outside her comfort zone. The Shona team went out of their way to make her comfortable and no words could adequately describe how appreciative I am for that. As for the hunting, Shona’s Tualuka lodge offers phenomenal free-range hunting. It can be hard hunting but offered the most enjoyed hunting that I’ve ever experienced. More importantly, Johann was clearly focused on my goals. I really wanted an old kudu bull and despite the fact that we had opportunities (and plenty of them) at younger, shootable bulls, Johann never once pressured me to shoot one of them. The efforts and dedication of Johann and Tjokkie resulted in me taking the ancient kudu bull that I’ve always dreamed of…I can’t thank them enough for that opportunity. Finally, I have to thank my wife. She is not a hunter but she really supported me during the hunting days. Even though our hard hunting took time away from her she never complained. In the end I took two magnificent trophies and that was a direct result of her support.